The Union Ministry of Social Welfare, Relief, and Resettlement has provided Ks 126.9 million to internally displaced persons (IDPs) who are taking refuge in Myaing Gyi Ngu IDP camp in the Karen State’s Hlaingbwe Township. 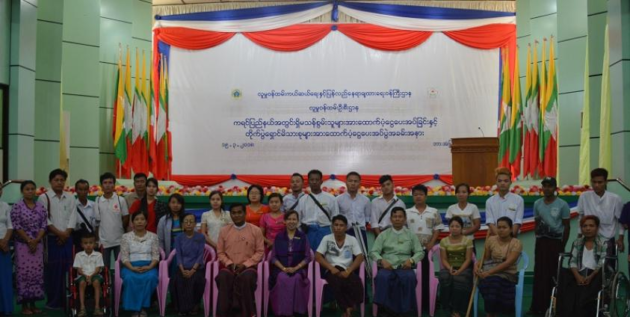 During the ceremony held at Zwekabin Hall in Hpa-an on March 19, the Department of Social Welfare’s director-general Dr. Daw San San Aye said the aids are provided to elderly persons, female head of households, pregnant women and children, and the disabled people from Myaing Gyi Ngu IDP camp. “We are giving aids to the people from the IDP area this year. In line with the chief minister’s instruction, we counted the number of groups that need more aids and we are providing aids to pregnant women, children under the age of five, elderly persons over the age of 60, and the disabled people. What’s unique this year is that we are providing aids to women who are leading their families,” said Dr. Daw San San Aye. Over 100 people including the officials from the Karen State government including the chief minister Nan Khin Htwe Myint, officials from the union government’s Department of Social Welfare, disabled people, and Karen civil society organizations attended the ceremony, which is part of the government’s national social protection strategy. Chief Minister Nan Khin Htwe Myint delivered a message during the ceremony and gave the aids and equipment to respective representatives. Twenty-six pregnant women, 910 children under the age of five, 174 elderly people above the age of 60, and seven disabled people from Myaing Gyi Ngu IDP camp receive Ks 100,000 each and 76 mothers who are leading the households receive Ks 200,000 each. A total of 4,616 disabled people from across the Karen State have been given Ks 100,000 each and wheelchairs. A total of Ks 588.5 million have been provided during the ceremony. “We have never received [the aids] before. We heard that we will receive it now, but we don’t know how much each person will receive. We don’t know when we will receive it,” Saw Shwe Tun, in-charge of Myaing Gyi Ngu IDP Camp, told KIC News. This is the first time the Union Ministry of Social Welfare, Relief, and Resettlement has provided aids to the IDPs, elderly persons, female head of households, pregnant women and children, and the disabled people in the Karen State.